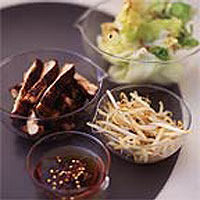 Classic teriyaki is made with mirin (a sweetened form of rice wine), which can be difficult to get hold of. If you do find some (try Chinese grocers), mix 7 tbsp each of sake, mirin and naturally brewed dark soy sauce, such as Kikkoman, in a small pan. Simmer for a few minutes then use instead of the sauce below. Serve the finished dish with a little steamed rice. Measure the sake, honey and soy sauce into a small, non-corrodible saucepan and add 2 tbsp water. Bring to a boil, stirring occasionally to ensure that the honey has melted. Simmer for a couple of minutes then set aside. You can make this in advance and store in the fridge once cold. Cut away the bones from the chicken thighs. Trim off excess fat and pierce the skin with the point of a sharp knife to allow the sauce to penetrate freely and to avoid shrinkage during frying. Preheat a non-stick frying pan over a high heat, then reduce the heat to medium and add 1 tbsp oil. Place the chicken pieces, skin side down, in the pan. Fry for a couple of minutes until golden brown, moving them once or twice to ensure that they don't burn. Turn the chicken pieces over and cover the pan. Cook for 10 minutes or until the legs are done. They will produce juice as they cook. Remove from the frying pan. Add 125ml of the sauce to the pan. Bring to the boil and stir until the sauce thickens slightly and looks glossy. Return the chicken and continue to cook, turning regularly, until the chicken is coated and the sauce almost completely reduced. Slice the chicken (skin side up) on a cutting board and arrange in a serving dish. If you want more sauce, heat the remaining sauce in the chicken pan while you are cutting up the thighs. Finally, heat a clean frying pan or wok over a high heat. Once hot, add 1 tbsp sunflower oil, followed by the beansprouts and a pinch of salt. Stir-fry briskly for 4-5 minutes or until wilted, then serve immediately with the chicken.